He has kept us waiting, he has he has, but Americana singer-songwriter Nathan Seeckts will release his debut album in late March. The Heart of the City is what you’re looking for, which you can sample with single ‘Old Blood’ out now. We have a quick chat to Nathan ahead of his single launch shows. First up, where are you from, how did you get your start in music and who are some of your inspirations? I was born and raised in Geelong. 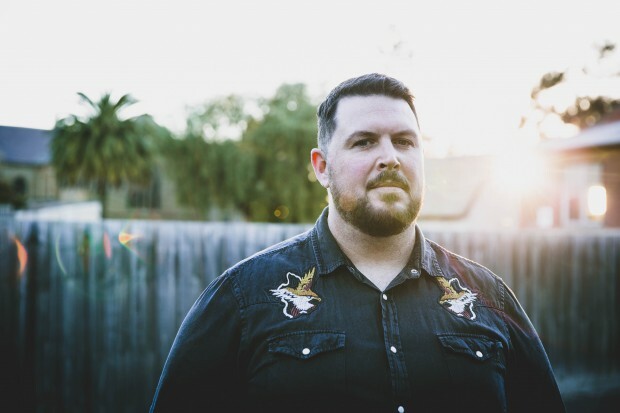 I started writing and recording as a solo artist in mid-2010 after years of playing in bands around the Geelong area, and I take my inspiration from the songbooks of artists like Bruce Springsteen, Jason Isbell, Lucero and Steve Earle. The sound on your new single seems a lot fuller in terms of backing instruments compared to your older music. What lead to this, and how has the recording of your album differed to your EPs? As I began putting the songs together for the album, I could hear all these extra parts in there that I simply couldn’t replicate with just vocals and an acoustic guitar. I’d been working with Sean McDonnell (electric guitar) for about six months and he began to add this whole other layer to the music I was writing. I was lucky enough to have a bunch of talented friends to call on to help me hit upon the sound I’d been chasing. For most of the album it’s Sean, Matt Dietrich (bass), Mark McLeod (drums) and I working together and on ‘Old Blood’ I had my former Dead City Lights band mate Nathan Barrett come in to sing backing vocals. We live tracked all the songs at Union Street Studio in Melbourne with Roger Bergodaz at the helm, who’s worked with Raised By Eagles, Freya Josephine Hollick, James Ellis and stacks of great artists. Is there a solid intention or a statement you are trying to make with the upcoming album, or something that you think will define it against your EPs? For all of the releases leading up to the album, I’d been acting as producer, engineer and performer. I wanted to able to focus purely on trying to capture the performance and feel of the tracks this time around. Having Roger behind the desk I was able to do that and I really think it shows, not only with the overall production, but with the depth of the songs themselves. How do you feel about Geelong’s current music scene, as a performer and a listener? Honestly, I’m pretty lucky. I get to play solo shows at venues like Pistol Pete’s and band shows at places like the Barwon Club and Workers, so I can’t complain. It’d be great to see a few more original venues with opportunities for smaller touring artists and up and comers, with like a 100 capacity room, but I don’t see that happening any time soon. Tell us about your single ‘Old Blood’, and the run of performances you are doing to launch it. Heading into the studio, Old Blood was one of the last songs I’d finished. In the rehearsals leading up to the recording we really struggled to make it land. I knew there was a great song in there, but for some reason the lyrics and the music just weren’t sitting well together. When I went to record the vocal track for it, it still wasn’t quite right. It didn’t have the same believability or honesty as the other songs on the album. So I went home with a rough mix of the bands tracks and totally rewrote the lyrics and vocal melody to the song from scratch within two days. I went back up to Union Street later that week and everything just came together and I found the song I knew was in there all along. Lyrically, it’s a cautionary tale. I’ve always said there’s a fine line between pride and arrogance and that sometimes it’s hard to tell the difference. That’s what the protagonist in this song fails to learn until it’s too late. When & Where: The Workers Club, Geelong – Saturday 16 February & The Taproom, Castlemaine – Friday 22 February.